We've got hold of all of the Super Mario Toys available in McDonald's recent Happy Meal promotion, join Tom as he checks them out! SuperZings Unboxing Series 1 | Invisible SuperZing! Neil has received a hefty package from our friends over at Big Chief studios, creators of fine collectable figures. As the video title makes undeniably clear, it's a figure of John Hurt's War Doctor, who first appeared in the 50th Anniversary Special of Dr Who alongside Matt Smith as The Doctor. Now these are cool! Join Neil as he unboxes some of these lovely collectible figures featuring some classic Arcade Game characters, including Pac-Man! We're back with another unboxing video for Series 6 of Zomblings, enjoy! London 8 November 2017: DreamToys, the UK’s most accurate and authoritative predictive list, today announced the top 12 toys expected to be the most sought after this Christmas. Nerf Nitro Longshot Smash and The Original Stretch Armstrong bring familiar names to the list while film and TV licenses are represented by PJ Masks Headquarters Playset, Lego’s Star Wars BB-8 and Paw Patrol Sea Patroller. Laser X – 2 Player Pack and the sequel to last year’s hit Hatchimals, Hatchimals Surprise, highlight the increasing creativity within the growing interactive toy market while L.O.L. Surprise Series 2 and Fingerlings showcase the importance of collectibles to the toy market. 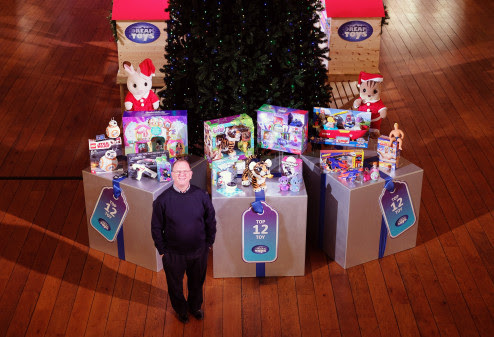 “This year’s DreamToys Top 12 is an exciting range of innovative toys that demonstrate the creativity of the toy industry and the magic of Christmas,” commented Gary Grant, chair of the DreamToys committee. New for 2017 is the DreamToys Facebook page (www.facebook.com/dreamtoysUK) which showcases all the toys selected on the list to help consumers choose the best product for them. Star Monsters Pocket Friends Series 2 Are Now Here! DAY 16 - Join us everyday of December!